Taylor will be joining the Department of Cognitive Science at UC San Diego as a new faculty member. But the CogSci department isn’t new to Taylor, who earned his B.S. there in 2011. Taylor is happy to be returning to sunny San Diego after six years in the rain, but he will miss his friends here in Seattle. HDS Lab member Ray Hong recently received an Innovation Corps Sites Program (I-Corps Site) grant from the National Science Foundation. The I-Corps Site program is designed to support entrepreneurialism and smooth the transition of research from academia to the market. Hong will use the award to develop the commercial potential of his “Traffigram” distance cartogram, which considers more than just proximity when calculating distance. “Most available distance cartograms are useful as long as you only care about travel time,” says Hong. “But people’s preferences are actually more complex than that.” For example, if someone is traveling to a city for a conference, they may want to find accommodation that’s not only nearby, but also within a certain price range and has been favorably reviewed. Ray is working on a series of techniques that that will make such tasks easier. HDS Lab member Sayamindu Dasgupta and his coauthor Benjamin Mako Hill received an Honorable Mention Award at CHI for their paper, “Scratch Community Blocks: Supporting Children as Data Scientists.” The award recognizes the top five percent of submissions to the SIGCHI 2017 conference. In the paper, they present a system that allows children in the online community around Scratch, a visual block-based programming language, to access, analyze, and visualize data about their own learning and social participation. Read more in the paper and Dr. Dasgupta’s blog post. Lab member Nan-Chen Chen recently passed her general exams and advanced to candidacy. She now begins work on her dissertation, which will focus on visual analytics for understanding changes in complex systems. 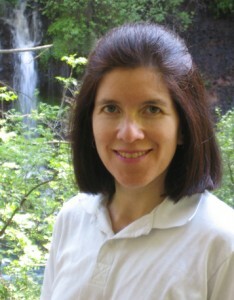 Her committee is chaired by Cecilia Aragon, and includes Gary Hsieh of HCDE, Andy Ko of the iSchool, and Been Kim of CSE. Lab members Meg Drouhard and Anissa Tanweer presented a paper co-authored with Brittany Fiore-Gartland at the CSCW 2017 Hackathon Workshop: Hacking and Making at Time Bound Events. They offered a preliminary typology of hackathon events that they’ve observed across various field sites while studying the practice and culture of data science. The typology identifies a number of dimensions for distinguishing different forms of hackathon-style events, and draws comparisons between what they dub “communal”, “contributive”, and “catalytic” hackathons. The paper can accessed here. 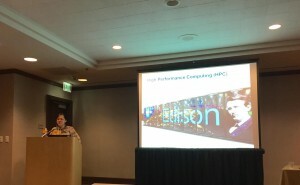 Also at CSCW, lab member Sarah Evans presented a paper coauthored with Katie Davis, Abigail Evans, Julie Ann Campbell, David P. Randall, Kodlee Yin and Cecilia Aragon. “More Than Peer Production: Fanfiction Communities as Sites of Distributed Mentoring” presents findings from a nine-month ethnographic study of fanfiction communities. Evans et al. find that members of these communities spontaneously mentor each other in open forums, and that this mentoring builds upon previous interactions in a way that is distinct from traditional forms of mentoring and is made possible by the affordances of networked publics. This current paper extends and develops the theory of distributed mentoring developed in the researchers’ previous work. 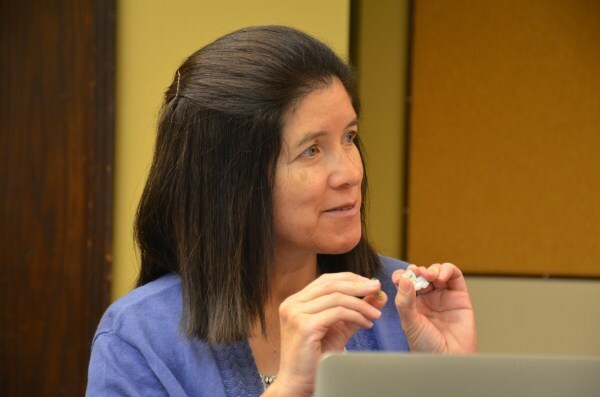 HDS Lab Director Cecilia Aragon recently received a Fulbright award from the U.S. Department of State. The purpose of the Core Fulbright U.S. Scholar Program is to enhance the exchange of knowledge and skills between people of the United States and other countries. Dr. Aragon will use the award to support work at the Universidad Técnica Federico Santa María in Valparaiso, Chile. There, she will collaborate with Chilean scholars to conduct research on human-centered data science and social media analysis, and will teach a course in visual analytics. Nan-Chen Chen and Dr. Been Kim of the Allen Institute for Artificial Intelligence. 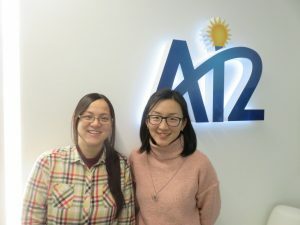 HDS Lab member Nan-Chen Chen was recently named the 2016 Intern of the Year at the Allen Institute for Artificial Intelligence, where she worked with Dr. Been Kim on the Aristo project. In that role, Chen designed and built a visual analytics tool called QSAnglyzer that is now being used by developers at the Allen Institute working on a question answering system. Lab member Meg Drouhard worked as a fellow for the Data Science for Social Good program at UW’s eScience Institute over the summer. 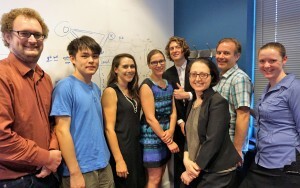 Meg’s “Open Sidewalks” team–four fellows, two data scientists, and two project leads–worked to improve standards and make more pedestrian data openly available. In particular, they focused on expanding access to data that could help people with limited mobility better navigate cities. The project was featured on the White House Fact Sheet (https://tcat.cs.washington.edu/OpenSidewalkFactSheet), and two team members presented at the Data Science for Social Good Conference in Chicago. More information about the project can be found at https://opensidewalks.com. 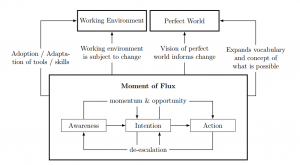 The Cycle of Deliberate Change developed in Katie Kuksenok’s dissertation. HDS Lab member Katerena Kuksenok successfully defended her doctoral dissertation on the interaction between programming and scientific practices in oceanography. As projects involve more people, longer time spans, and more ambitious collaboration between disciplines, understanding how coding practices influence scientific inquiry is increasingly important. The discussion of “best practices” in open science encourages the sharing of negative results and disappointing data as a top priority. This call for reflection on failure must be extended to include code work. With data as well as with code sharing, repeated “best practices” are not sufficient to inspire change, even for those scientists who openly feel they “should” do it. The conceptual framework Katie proposes creates optimistic vocabulary for reflecting upon deliberate change. Also, HDS Lab member and communication graduate student, Anissa Tanweer, completed her general exams this quarter and advanced to PhD candidacy. Her dissertation work will focus on the drive to use big data in the pursuit of social change and policy formation, and the cross-sector collaborations that support that movement. At the recent Convening on Urban Data Science, held at the University of Chicago on April 27-29, HDS Lab member Brittany Fiore-Gartland presented a talk titled, “Data Science Studies: Toward a sociotechnical and ethical urban data science.” Dr. Fiore-Gartland made the argument that in the context of urban data science, in which there is an influx of computational scientists working on problems of social good and social science, there is a pressing need to integrate sociotechnical and ethical perspectives into practice. There is still an open question around what are the most successful structures for integrating ethnographic research and translating a sociological perspective on science and technology into something valuable for urban data science collaborations. She articulated one model of integration, discussed several modes of translation, and proposed future directions for the integration of social research into urban data science.